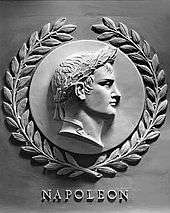 Napoleon Bonaparte (Napoléon Bonaparte; /nəˈpoʊliən, -ˈpoʊljən/; French: [napɔleɔ̃ bɔnapaʁt], Italian: [napoleoŋe bɔŋaparte], born "Napoleone di Buonaparte" (Italian: [napoleoŋe dj buɔŋaparte]); 15 August 1769 – 5 May 1821) was a French military and political leader who rose to prominence during the French Revolution and led several successful campaigns during the Revolutionary Wars. 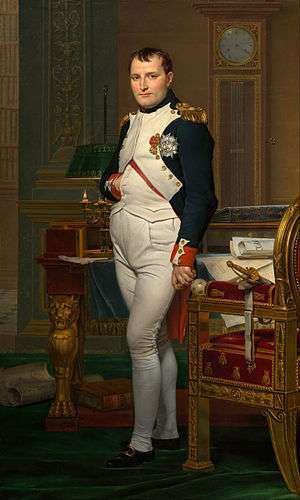 As Napoleon I, he was Emperor of the French from 1804 until 1814, and again in 1815. 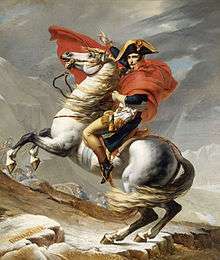 Napoleon dominated European and global affairs for more than a decade while leading France against a series of coalitions in the Napoleonic Wars. He won most of these wars and the vast majority of his battles, building a large empire that ruled over continental Europe before its final collapse in 1815. One of the greatest commanders in history, his wars and campaigns are studied at military schools worldwide. Napoleon's political and cultural legacy has ensured his status as one of the most celebrated and controversial leaders in human history. 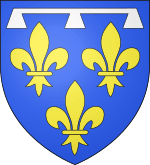 He was born in Corsica to a relatively modest family from the minor nobility. When the Revolution broke out in 1789, Napoleon was serving as an artillery officer in the French army. He attempted to capitalize quickly on the new political situation by returning to Corsica in hopes of starting a political career. After that venture failed, he came back to the military and rose rapidly through the ranks, ending up as commander of the Army of Italy after saving the governing Directory by suppressing a revolt from royalist insurgents. At age 26, he began his first military campaign against the Austrians and their Italian allies, scoring a series of decisive victories, conquering the Italian Peninsula in a year, and becoming a national hero. 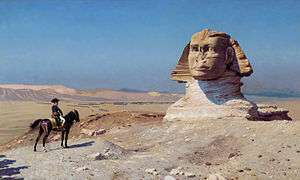 In 1798, he led a military expedition to Egypt that served as a springboard to political power. He engineered a coup in November 1799 and became First Consul of the Republic. 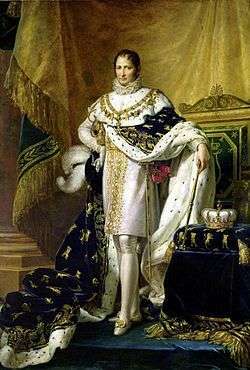 His rising ambition inspired him to go further, and in 1804 he became the first Emperor of the French. 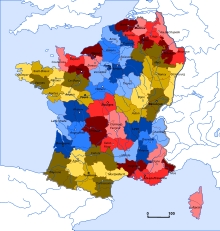 Intractable differences with the British meant that the French were facing a Third Coalition by 1805. Napoleon shattered this coalition with decisive victories in the Ulm Campaign and a historic triumph over Russia and Austria at the Battle of Austerlitz, which led to the elimination of the Holy Roman Empire. In 1806, the Fourth Coalition took up arms against him because Prussia became worried about growing French influence on the continent. Napoleon quickly knocked out Prussia at the battles of Jena and Auerstedt, then marched the Grand Army deep into Eastern Europe and annihilated the Russians in June 1807 at the Battle of Friedland. France then forced the defeated nations of the Fourth Coalition to sign the Treaties of Tilsit in July 1807, bringing an uneasy peace to the continent. Tilsit signified the high watermark of the French Empire. In 1809, the Austrians challenged the French again during the War of the Fifth Coalition, but Napoleon solidified his grip over Europe after triumphing at the Battle of Wagram in July. Hoping to extend the Continental System and choke off British trade with the European mainland, Napoleon invaded Iberia and declared his brother Joseph the King of Spain in 1808. The Spanish and the Portuguese revolted with British support. 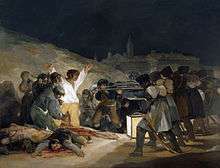 The Peninsular War lasted six years, featured extensive guerrilla warfare, and ended in victory for the Allies. The Continental System caused recurring diplomatic conflicts between France and its client states, especially Russia. Unwilling to bear the economic consequences of reduced trade, the Russians routinely violated the Continental System and enticed Napoleon into another war. The French launched a major invasion of Russia in the summer of 1812. 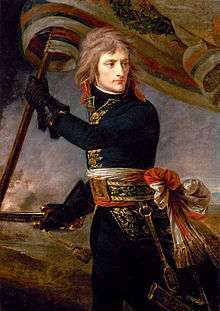 The resulting campaign witnessed the collapse of the Grand Army, the destruction of Russian cities, and inspired a renewed push against Napoleon by his enemies. In 1813, Prussia and Austria joined Russian forces in a Sixth Coalition against France. A lengthy military campaign culminated in a large Allied army defeating Napoleon at the Battle of Leipzig in October 1813. The Allies then invaded France and captured Paris in the spring of 1814, forcing Napoleon to abdicate in April. He was exiled to the island of Elba near Rome and the Bourbons were restored to power. 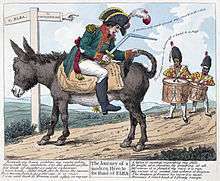 However, Napoleon escaped from Elba in February 1815 and took control of France once again. 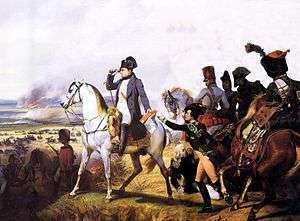 The Allies responded by forming a Seventh Coalition, which defeated Napoleon at the Battle of Waterloo in June. The British exiled him to the remote island of Saint Helena in the South Atlantic, where he spent the remainder of his years. His death in 1821 at the age of 51 was received with surprise, shock, and grief throughout Europe, leaving behind a memory that still persists. Napoleon had an extensive and powerful influence on the modern world, bringing liberal reforms to the numerous territories that he conquered and controlled, such as the Low Countries, Switzerland, and large parts of modern Italy and Germany. He implemented fundamental liberal policies in France and throughout Western Europe. [note 1] His legal achievement, the Napoleonic Code, has influenced the legal systems of more than 70 nations around the world. British historian Andrew Roberts stated, "The ideas that underpin our modern world—meritocracy, equality before the law, property rights, religious toleration, modern secular education, sound finances, and so on—were championed, consolidated, codified and geographically extended by Napoleon. To them he added a rational and efficient local administration, an end to rural banditry, the encouragement of science and the arts, the abolition of feudalism and the greatest codification of laws since the fall of the Roman Empire." 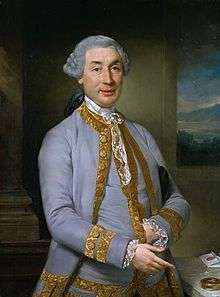 His father Nobile Carlo Buonaparte was an attorney, and was named Corsica's representative to the court of Louis XVI in 1777. The dominant influence of Napoleon's childhood was his mother, Letizia Ramolino, whose firm discipline restrained a rambunctious child. 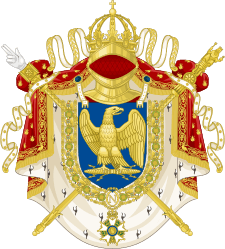 Napoleon's maternal grandmother had married into the Swiss Fesch family in her second marriage, and Napoleon's uncle, the cardinal Joseph Fesch, would fulfill the role as protector of the Bonaparte family for some years. He had an elder brother, Joseph, and younger siblings: Lucien, Elisa, Louis, Pauline, Caroline, and Jérôme. A boy and girl were born before Joseph but died in infancy. Napoleon was baptised as a Catholic. Upon graduating in September 1785, Bonaparte was commissioned a second lieutenant in La Fère artillery regiment. [note 4] He served in Valence and Auxonne until after the outbreak of the Revolution in 1789, and took nearly two years' leave in Corsica and Paris during this period. 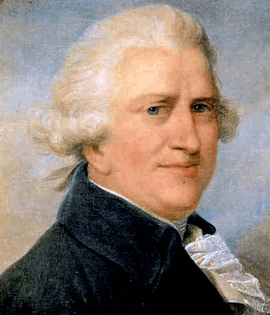 At this time, he was a fervent Corsican nationalist, and wrote to Corsican leader Pasquale Paoli in May 1789, "As the nation was perishing I was born. Thirty thousand Frenchmen were vomited on to our shores, drowning the throne of liberty in waves of blood. Such was the odious sight which was the first to strike me." He spent the early years of the Revolution in Corsica, fighting in a complex three-way struggle among royalists, revolutionaries, and Corsican nationalists. He was a supporter of the republican Jacobin movement, organising clubs in Corsica, and was given command over a battalion of volunteers. He was promoted to captain in the regular army in July 1792, despite exceeding his leave of absence and leading a riot against a French army in Corsica. 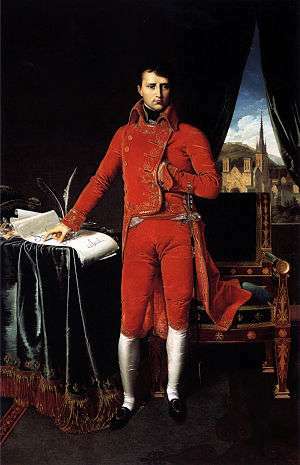 Some contemporaries alleged that Bonaparte was put under house arrest at Nice for his association with the Robespierres following their fall in the Thermidorian Reaction in July 1794, but Napoleon's secretary Bourrienne disputed the allegation in his memoirs. According to Bourrienne, jealousy was responsible, between the Army of the Alps and the Army of Italy (with whom Napoleon was seconded at the time). Bonaparte dispatched an impassioned defense in a letter to the commissar Salicetti, and he was subsequently acquitted of any wrongdoing. He was released within two weeks and, due to his technical skills, was asked to draw up plans to attack Italian positions in the context of France's war with Austria. He also took part in an expedition to take back Corsica from the British, but the French were repulsed by the British Royal Navy. His application of conventional military ideas to real-world situations enabled his military triumphs, such as creative use of artillery as a mobile force to support his infantry. He stated later in life: "I have fought sixty battles and I have learned nothing which I did not know at the beginning. Look at Caesar; he fought the first like the last." After two months of planning, Bonaparte decided that France's naval power was not yet strong enough to confront the British Royal Navy. He decided on a military expedition to seize Egypt and thereby undermine Britain's access to its trade interests in India. Bonaparte wished to establish a French presence in the Middle East, with the ultimate dream of linking with Tipu Sultan, a Muslim enemy of the British in India. On 1 August, the British fleet under Horatio Nelson captured or destroyed all but two French vessels in the Battle of the Nile, defeating Bonaparte's goal to strengthen the French position in the Mediterranean. His army had succeeded in a temporary increase of French power in Egypt, though it faced repeated uprisings. In early 1799, he moved an army into the Ottoman province of Damascus (Syria and Galilee). Bonaparte led these 13,000 French soldiers in the conquest of the coastal towns of Arish, Gaza, Jaffa, and Haifa. The attack on Jaffa was particularly brutal. Bonaparte discovered that many of the defenders were former prisoners of war, ostensibly on parole, so he ordered the garrison and 1,400 prisoners to be executed by bayonet or drowning to save bullets. Men, women, and children were robbed and murdered for three days. Napoleon established a political system that historian Martyn Lyons called "dictatorship by plebiscite." Worried by the democratic forces unleashed by the Revolution, but unwilling to ignore them entirely, Napoleon resorted to regular electoral consultations with the French people on his road to imperial power. He drafted the Constitution of the Year VIII and secured his own election as First Consul, taking up residence at the Tuileries. The constitution was approved in a rigged plebiscite held the following January, with 99.94 percent officially listed as voting "yes." 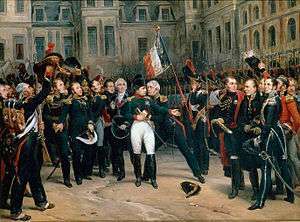 Napoleon's brother, Lucien, had falsified the returns to show that 3 million people had participated in the plebiscite; the real number was 1.5 million. Political observers at the time assumed the eligible French voting public numbered about 5 million people, so the regime artificially doubled the participation rate to indicate popular enthusiasm for the Consulate. In the first few months of the Consulate, with war in Europe still raging and internal instability still plaguing the country, Napoleon's grip on power remained very tenuous. 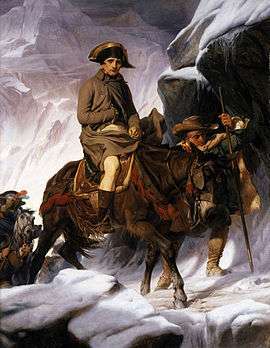 In the spring of 1800, Napoleon and his troops crossed the Swiss Alps into Italy, aiming to surprise the Austrian armies that had reoccupied the peninsula when Napoleon was still in Egypt. [note 5] After a difficult crossing over the Alps, the French army entered the plains of Northern Italy virtually unopposed. While one French army approached from the north, the Austrians were busy with another stationed in Genoa, which was besieged by a substantial force. The fierce resistance of this French army, under André Masséna, gave the northern force some time to carry out their operations with little interference. After spending several days looking for each other, the two armies collided at the Battle of Marengo on 14 June. General Melas had a numerical advantage, fielding about 30,000 Austrian soldiers while Napoleon commanded 24,000 French troops. The battle began favorably for the Austrians as their initial attack surprised the French and gradually drove them back. Melas stated that he'd won the battle and retired to his headquarters around 3 pm, leaving his subordinates in charge of pursuing the French. The French lines never broke during their tactical retreat; Napoleon constantly rode out among the troops urging them to stand and fight. Late in the afternoon, a full division under Desaix arrived on the field and reversed the tide of the battle. A series of artillery barrages and cavalry charges decimated the Austrian army, which fled over the Bormida River back to Alessandria, leaving behind 14,000 casualties. The following day, the Austrian army agreed to abandon Northern Italy once more with the Convention of Alessandria, which granted them safe passage to friendly soil in exchange for their fortresses throughout the region. Although critics have blamed Napoleon for several tactical mistakes preceding the battle, they have also praised his audacity for selecting a risky campaign strategy, choosing to invade the Italian peninsula from the north when the vast majority of French invasions came from the west, near or along the coastline. As Chandler points out, Napoleon spent almost a year getting the Austrians out of Italy in his first campaign; in 1800, it took him only a month to achieve the same goal. German strategist and field marshal Alfred von Schlieffen concluded that "Bonaparte did not annihilate his enemy but eliminated him and rendered him harmless" while "[attaining] the object of the campaign: the conquest of North Italy." Napoleon's triumph at Marengo secured his political authority and boosted his popularity back home, but it did not lead to an immediate peace. 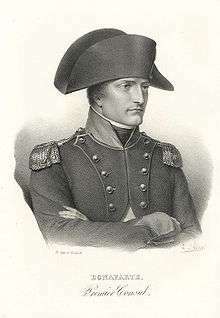 Bonaparte's brother, Joseph, led the complex negotiations in Lunéville and reported that Austria, emboldened by British support, would not acknowledge the new territory that France had acquired. 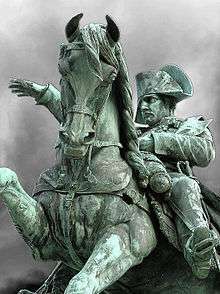 As negotiations became increasingly fractious, Bonaparte gave orders to his general Moreau to strike Austria once more. Moreau and the French swept through Bavaria and scored an overwhelming victory at Hohenlinden in December 1800. As a result, the Austrians capitulated and signed the Treaty of Lunéville in February 1801. The treaty reaffirmed and expanded earlier French gains at Campo Formio. Britain now remained the only nation that was still at war with France. Napoleon's coronation took place on 2 December 1804. Two separate crowns were brought for the ceremony: a golden laurel wreath recalling the Roman Empire and a replica of Charlemagne's crown. Napoleon entered the ceremony wearing the laurel wreath and kept it on his head throughout the proceedings. For the official coronation, he raised the Charlemagne crown over his own head in a symbolic gesture, but never placed it on top because he was already wearing the golden wreath. 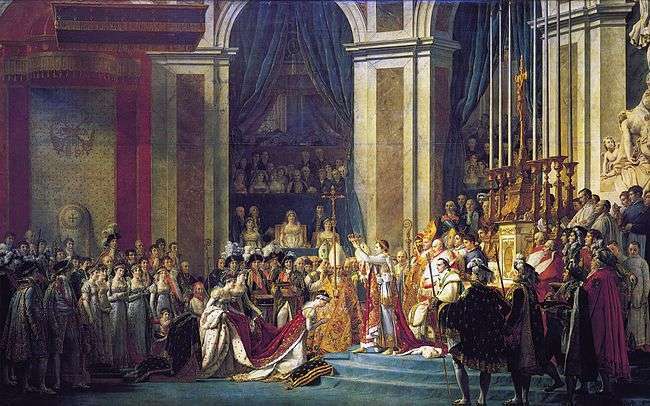 Instead he placed the crown on Josephine's head, the event commemorated in the officially sanctioned painting by Jacques-Louis David. Napoleon was also crowned King of Italy, with the Iron Crown of Lombardy, at the Cathedral of Milan on 26 May 1805. He created eighteen Marshals of the Empire from amongst his top generals to secure the allegiance of the army. Before the formation of the Third Coalition, Napoleon had assembled an invasion force, the Armée d'Angleterre, around six camps at Boulogne in Northern France. He intended to use this invasion force to strike at England. They never invaded, but Napoleon's troops received careful and invaluable training for future military operations. The men at Boulogne formed the core for what Napoleon later called La Grande Armée. At the start, this French army had about 200,000 men organized into seven corps, which were large field units that contained 36 to 40 cannons each and were capable of independent action until other corps could come to the rescue. A single corps properly situated in a strong defensive position could survive at least a day without support, giving the Grande Armée countless strategic and tactical options on every campaign. On top of these forces, Napoleon created a cavalry reserve of 22,000 organized into two cuirassier divisions, four mounted dragoon divisions, one division of dismounted dragoons, and one of light cavalry, all supported by 24 artillery pieces. 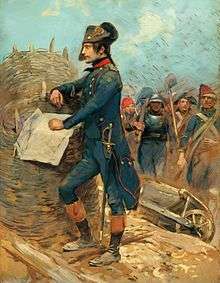 By 1805, the Grande Armée had grown to a force of 350,000 men, who were well equipped, well trained, and led by competent officers. Following the Ulm Campaign, French forces managed to capture Vienna in November. The fall of Vienna provided the French a huge bounty as they captured 100,000 muskets, 500 cannons, and the intact bridges across the Danube. At this critical juncture, both Tsar Alexander I and Holy Roman Emperor Francis II decided to engage Napoleon in battle, despite reservations from some of their subordinates. Napoleon sent his army north in pursuit of the Allies, but then ordered his forces to retreat so that he could feign a grave weakness. 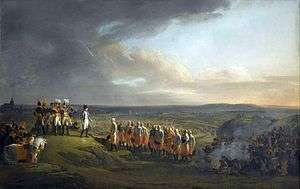 Desperate to lure the Allies into battle, Napoleon gave every indication in the days preceding the engagement that the French army was in a pitiful state, even abandoning the dominant Pratzen Heights near the village of Austerlitz. At the Battle of Austerlitz, in Moravia on 2 December, he deployed the French army below the Pratzen Heights and deliberately weakened his right flank, enticing the Allies to launch a major assault there in the hopes of rolling up the whole French line. A forced march from Vienna by Marshal Davout and his III Corps plugged the gap left by Napoleon just in time. Meanwhile, the heavy Allied deployment against the French right weakened their center on the Pratzen Heights, which was viciously attacked by the IV Corps of Marshal Soult. With the Allied center demolished, the French swept through both enemy flanks and sent the Allies fleeing chaotically, capturing thousands of prisoners in the process. The battle is often seen as a tactical masterpiece because of the near-perfect execution of a calibrated but dangerous plan — of the same stature as Cannae, the celebrated triumph by Hannibal some 2,000 years before. The initial military maneuvers began in September 1806. In a letter to Marshal Soult detailing the plan for the campaign, Napoleon described the essential features of Napoleonic warfare and introduced the phrase le bataillon-carré ("square battalion"). In the bataillon-carré system, the various corps of the Grande Armée would march uniformly together in close supporting distance. If any single corps was attacked, the others could quickly spring into action and arrive to help. Napoleon invaded Prussia with 180,000 troops, rapidly marching on the right bank of the River Saale. As in previous campaigns, his fundamental objective was to destroy one opponent before reinforcements from another could tip the balance of the war. Upon learning the whereabouts of the Prussian army, the French swung westwards and crossed the Saale with overwhelming force. At the twin battles of Jena and Auerstedt, fought on 14 October, the French convincingly defeated the Prussians and inflicted heavy casualties. With several major commanders dead or incapacitated, the Prussian king proved incapable of effectively commanding the army, which began to quickly disintegrate. In a vaunted pursuit that epitomized the "peak of Napoleonic warfare," according to historian Richard Brooks, the French managed to capture 140,000 soldiers, over 2,000 cannons and hundreds of ammunition wagons, all in a single month. Historian David Chandler wrote of the Prussian forces: "Never has the morale of any army been more completely shattered." Despite their overwhelming defeat, the Prussians refused to negotiate with the French until the Russians had an opportunity to enter the fight. Following his triumph, Napoleon imposed the first elements of the Continental System through the Berlin Decree issued in November 1806. The Continental System, which prohibited European nations from trading with Britain, was widely violated throughout his reign. 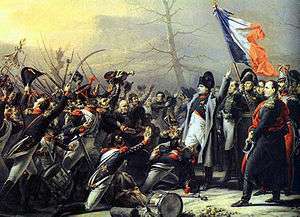 In the next few months, Napoleon marched against the advancing Russian armies through Poland and was involved in the bloody stalemate at the Battle of Eylau in February 1807. After a period of rest and consolidation on both sides, the war restarted in June with an initial struggle at Heilsberg that proved indecisive. 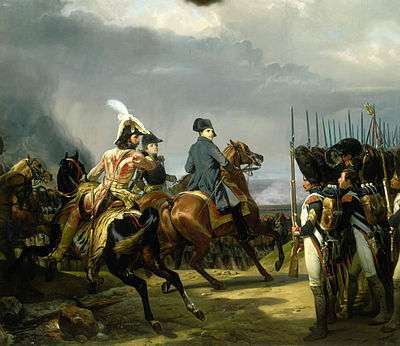 On 14 June, however, Napoleon finally obtained an overwhelming victory over the Russians at the Battle of Friedland, wiping out the majority of the Russian army in a very bloody struggle. The scale of their defeat convinced the Russians to make peace with the French. On 19 June, Czar Alexander sent an envoy to seek an armistice with Napoleon. The latter assured the envoy that the Vistula River represented the natural borders between French and Russian influence in Europe. On that basis, the two emperors began peace negotiations at the town of Tilsit after meeting on an iconic raft on the River Niemen. The very first thing Alexander said to Napoleon was probably well-calibrated: "I hate the English as much as you do." Alexander faced pressure from his brother, Duke Constantine, to make peace with Napoleon. 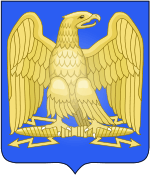 Given the victory he had just achieved, the French emperor offered the Russians relatively lenient terms–demanding that Russia join the Continental System, withdraw its forces from Wallachia and Moldavia, and hand over the Ionian Islands to France. 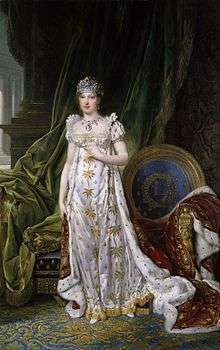 By contrast, Napoleon dictated very harsh peace terms for Prussia, despite the ceaseless exhortations of Queen Louise. Wiping out half of Prussian territories from the map, Napoleon created a new kingdom of 1,100 square miles called Westphalia. 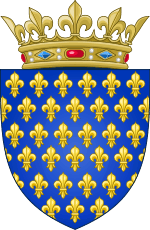 He then appointed his young brother Jérôme as the new monarch of this kingdom. Prussia's humiliating treatment at Tilsit caused a deep and bitter antagonism which festered as the Napoleonic era progressed. Moreover, Alexander's pretensions at friendship with Napoleon led the latter to seriously misjudge the true intentions of his Russian counterpart, who would violate numerous provisions of the treaty in the next few years. Despite these problems, the Treaties of Tilsit at last gave Napoleon a respite from war and allowed him to return to France, which he had not seen in over 300 days. In the Kingdom of Holland, the British launched the Walcheren Campaign to open up a second front in the war and to relieve the pressure on the Austrians. The British army only landed at Walcheren on 30 July, by which point the Austrians had already been defeated. The Walcheren Campaign was characterized by little fighting but heavy casualties thanks to the popularly dubbed "Walcheren Fever." Over 4000 British troops were lost in a bungled campaign, and the rest withdrew in December 1809. The main strategic result from the campaign became the delayed political settlement between the French and the Austrians. Emperor Francis wanted to wait and see how the British performed in their theater before entering into negotiations with Napoleon. Once it became apparent that the British were going nowhere, the Austrians agreed to peace talks. The Russian army withdrew and retreated past Moscow. Napoleon entered the city, assuming its fall would end the war and Alexander would negotiate peace. However, on orders of the city's governor Feodor Rostopchin, rather than capitulation, Moscow was burned. After five weeks, Napoleon and his army left. In early November Napoleon got concerned about loss of control back in France after the Malet coup of 1812. His army walked through snow up to their knees and nearly 10,000 men and horses froze to death on the night of 8/9 November alone. After Battle of Berezina Napoleon succeeded to escape but had to abandon much of the remaining artillery and baggage train. 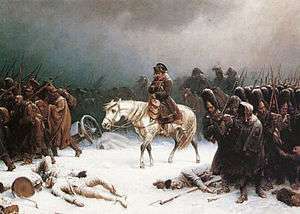 On 5 December, shortly before arriving in Vilnius, Napoleon left the army in a sledge. In the Treaty of Fontainebleau, the Allies exiled him to Elba, an island of 12,000 inhabitants in the Mediterranean, 20 km (12 mi) off the Tuscan coast. They gave him sovereignty over the island and allowed him to retain the title of Emperor. Napoleon attempted suicide with a pill he had carried after nearly being captured by the Russians during the retreat from Moscow. 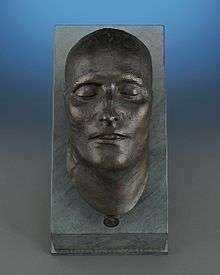 Its potency had weakened with age, however, and he survived to be exiled while his wife and son took refuge in Austria. In the first few months on Elba he created a small navy and army, developed the iron mines, oversaw the construction of new roads, issued decrees on modern agricultural methods, and overhauled the island's legal and educational system. 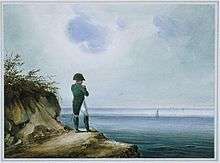 Separated from his wife and son, who had returned to Austria, cut off from the allowance guaranteed to him by the Treaty of Fontainebleau, and aware of rumours he was about to be banished to a remote island in the Atlantic Ocean, Napoleon escaped from Elba, in the brig Inconstant on 26 February 1815 with 700 men over him. Two days later, he landed on the French mainland at Golfe-Juan and started heading north. The 5th Regiment was sent to intercept him and made contact just south of Grenoble on 7 March 1815. Napoleon approached the regiment alone, dismounted his horse and, when he was within gunshot range, shouted to the soldiers, "Here I am. Kill your Emperor, if you wish." The soldiers quickly responded with, "Vive L'Empereur!" Ney, who had boasted to the restored Bourbon king, Louis XVIII, that he would bring Napoleon to Paris in an iron cage, affectionately kissed his former emperor and forgot his oath of allegiance to the Bourbon monarch. The two then marched together towards Paris with a growing army. The unpopular Louis XVIII fled to Belgium after realizing he had little political support. On 13 March, the powers at the Congress of Vienna declared Napoleon an outlaw. Four days later, Great Britain, Russia, Austria, and Prussia each pledged to put 150,000 men into the field to end his rule. The cause of his death has been debated. 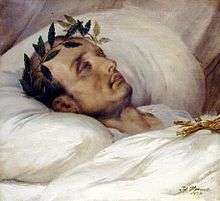 Napoleon's physician, François Carlo Antommarchi, led the autopsy, which found the cause of death to be stomach cancer. Antommarchi did not sign the official report. Napoleon's father had died of stomach cancer, although this was seemingly unknown at the time of the autopsy. Antommarchi found evidence of a stomach ulcer; this was the most convenient explanation for the British, who wanted to avoid criticism over their care of Napoleon. Napoleon's baptism took place in Ajaccio on 21 July 1771; he was piously raised as a Catholic but he never developed much faith. As an adult, Napoleon was a deist. Napoleon's deity was an absent and distant God. However he had a keen appreciation of the power of organized religion in social and political affairs, and paid a great deal of attention to bending it to his purposes. He noted the influence of Catholicism's rituals and splendors. Napoleon had a civil marriage with Joséphine de Beauharnais, without religious ceremony. 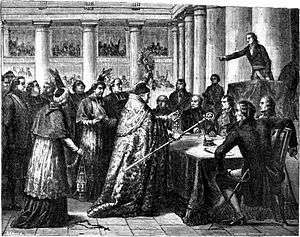 Napoleon was crowned Emperor on 2 December 1804 at Notre Dame de Paris in a ceremony presided over by Pope Pius VII. On 1 April 1810, Napoleon married the Austrian princess Marie Louise in a Catholic ceremony. During his brother's rule in Spain, he abolished the Spanish Inquisition in 1813. While the Concordat restored much power to the papacy, the balance of church–state relations had tilted firmly in Napoleon's favour. He selected the bishops and supervised church finances. Napoleon and the pope both found the Concordat useful. Similar arrangements were made with the Church in territories controlled by Napoleon, especially Italy and Germany. Now, Napoleon could win favor with the Catholics while also controlling Rome in a political sense. Napoleon said in April 1801, "Skillful conquerors have not got entangled with priests. They can both contain them and use them." French children were issued a catechism that taught them to love and respect Napoleon. Historians emphasize the strength of the ambition that took Napoleon from an obscure village to command of most of Europe. George F. E. Rudé stresses his "rare combination of will, intellect and physical vigour." At 5 ft 6 in (168 cm), he was not physically imposing but in one-on-one situations he typically had a hypnotic effect on people and seemingly bent the strongest leaders to his will. He understood military technology, but was not an innovator in that regard. He was an innovator in using the financial, bureaucratic, and diplomatic resources of France. He could rapidly dictate a series of complex commands to his subordinates, keeping in mind where major units were expected to be at each future point, and like a chess master, "seeing" the best plays moves ahead. Napoleon maintained strict, efficient work habits, prioritizing what needed to be done. He cheated at cards, but repaid the losses; he had to win at everything he attempted. He kept relays of staff and secretaries at work. Unlike many generals, Napoleon did not examine history to ask what Hannibal or Alexander or anyone else did in a similar situation. Critics said he won many battles simply because of luck; Napoleon responded, "Give me lucky generals," aware that "luck" comes to leaders who recognize opportunity, and seize it. Dwyer states that Napoleon's victories at Austerlitz and Jena in 1805–06 heightened his sense of self-grandiosity, leaving him even more certain of his destiny and invincibility. In terms of influence on events, it was more than Napoleon's personality that took effect. He reorganized France itself to supply the men and money needed for wars. He inspired his men—Wellington said his presence on the battlefield was worth 40,000 soldiers, for he inspired confidence from privates to field marshals. He also unnerved the enemy. At the Battle of Auerstadt in 1806, King Frederick William III of Prussia outnumbered the French by 63,000 to 27,000; however, when he mistakenly was told that Napoleon was in command, he ordered a hasty retreat that turned into a rout. 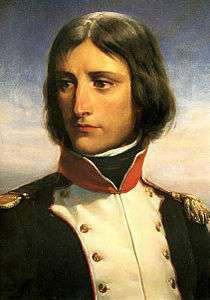 The force of his personality neutralized material difficulties as his soldiers fought with the confidence that with Napoleon in charge they would surely win. Napoleon instituted various reforms, such as higher education, a tax code, road and sewer systems, and established the Banque de France, the first central bank in French history. He negotiated the Concordat of 1801 with the Catholic Church, which sought to reconcile the mostly Catholic population to his regime. It was presented alongside the Organic Articles, which regulated public worship in France. He has dissolved the Holy Roman Empire prior to German Unification later in the 19th century. The sale of the Louisiana Territory to the United States doubled the size of the United States. The Napoleonic code was adopted throughout much of Europe, though only in the lands he conquered, and remained in force after Napoleon's defeat. Napoleon said: "My true glory is not to have won forty battles ... Waterloo will erase the memory of so many victories. ... But ... what will live forever, is my Civil Code." The Code influences a quarter of the world's jurisdictions such as that of in Europe, the Americas and Africa. The official introduction of the metric system in September 1799 was unpopular in large sections of French society. 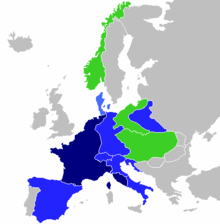 Napoleon's rule greatly aided adoption of the new standard not only across France but also across the French sphere of influence. 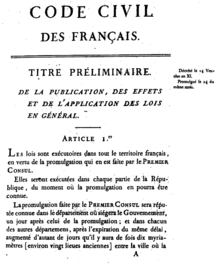 Napoleon took a retrograde step in 1812 when he passed legislation to introduce the mesures usuelles (traditional units of measurement) for retail trade—a system of measure that resembled the pre-revolutionary units but were based on the kilogram and the metre; for example the livre metrique (metric pound) was 500 g instead of 489.5 g—the value of the livre du roi (the king's pound). Other units of measure were rounded in a similar manner prior to the definitive introduction of the metric system across Europe in the middle of the 19th century. In the political realm, historians debate whether Napoleon was "an enlightened despot who laid the foundations of modern Europe or, instead, a megalomaniac who wrought greater misery than any man before the coming of Hitler." Many historians have concluded that he had grandiose foreign policy ambitions. The Continental powers as late as 1808 were willing to give him nearly all of his gains and titles, but some scholars maintain he was overly aggressive and pushed for too much, until his empire collapsed. 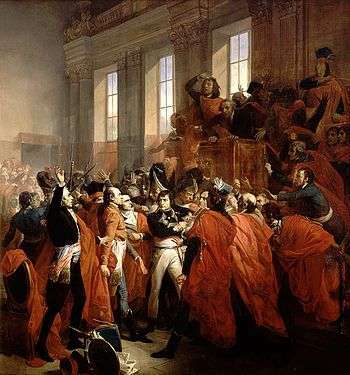 Napoleon ended lawlessness and disorder in post-Revolutionary France. He was considered a tyrant and usurper by his opponents. His critics charge that he was not troubled when faced with the prospect of war and death for thousands, turned his search for undisputed rule into a series of conflicts throughout Europe and ignored treaties and conventions alike. His role in the Haitian Revolution and decision to reinstate slavery in France's oversea colonies are controversial and affect his reputation. Napoleon institutionalised plunder of conquered territories: French museums contain art stolen by Napoleon's forces from across Europe. Artefacts were brought to the Musée du Louvre for a grand central museum; his example would later serve as inspiration for more notorious imitators. He was compared to Adolf Hitler most famously by the historian Pieter Geyl in 1947 and Claude Ribbe in 2005. David G. Chandler, a foremost historian of Napoleonic warfare, wrote in 1973 that, "Nothing could be more degrading to the former [Napoleon] and more flattering to the latter [Hitler]. The comparison is odious. On the whole Napoleon was inspired by a noble dream, wholly dissimilar from Hitler's... Napoleon left great and lasting testimonies to his genius—in codes of law and national identities which survive to the present day. Adolf Hitler left nothing but destruction." In March 1810, he married the 19-year old Marie Louise, Archduchess of Austria, and a great niece of Marie Antoinette by proxy; thus he had married into a German royal and imperial family. Louise was less than happy with the arrangement, at least at first, stating "Just to see the man would be the worst form of torture." Her great-aunt had been executed in France, while Napoleon had fought numerous campaigns against Austria all throughout his military career. However, she seemed to warm up to him over time. After her wedding, she wrote to her father "He loves me very much. I respond to his love sincerely. There is something very fetching and very eager about him that is impossible to resist." Napoleon and Marie Louis remained married until his death, though she did not join him in exile on Elba and thereafter never saw her husband again. The couple had one child, Napoleon Francis Joseph Charles (1811–1832), known from birth as the King of Rome. He became Napoleon II in 1814 and reigned for only two weeks. He was awarded the title of the Duke of Reichstadt in 1818 and died of tuberculosis aged 21, with no children. ↑ Napoleon's height was 5 ft 2 in in French measure according to Antommarchi at Napoleon's autopsy, whereas British sources put his height at 5 ft 6 in in imperial measure: both equivalent to 1.68 m. Napoleon surrounded himself with tall bodyguards and was affectionately nicknamed le petit caporal, reflecting his reported camaraderie with his soldiers rather than his height. ↑ Charles Messenger, ed. (2001). Reader's Guide to Military History. Routledge. pp. 391–427. ISBN 978-1-135-95970-8. ↑ Philip Ingram (1998). Napoleon and Europe. Nelson Thornes. pp. 47–49. ↑ Conner, S. P. The Age of Napoleon. Greenwood Publishing Group, 2004, pp. 38-40. ↑ 2012 DNA tests found that some of the family's ancestors were from the Caucasus region; "Le Figaro – Mon Figaro : Selon son ADN,les ancêtres de Napoléon seraient du Caucase!". Le Figaro. 15 January 2012. Retrieved 20 February 2012. ; The study found haplogroup type E1b1c1*, which originated in Northern Africa circa 1200 BC; the people migrated into the Caucasus and into Europe. "Haplogroup of the Y Chromosome of Napoléon the First; Gerard Lucotte, Thierry Thomasset, Peter Hrechdakian; Journal of Molecular Biology Research". December 2011. Retrieved 18 February 2012. ↑ David Nicholls (1999). Napoleon: A Biographical Companion. ABC-CLIO. p. 131. ↑ Patrice Gueniffey, Bonaparte: 1769–1802 (Harvard UP, 2015), pp 137-59. ↑ Bourrienne, Memoirs of Napoleon, p.39. ↑ Bourrienne, Memoirs of Napoleon, p.38. ↑ "The works of Thomas Carlyle – The French Revolution, vol.III, book 3.VII". Google. ↑ Gueniffey, Bonaparte: 1769–1802 pp 500-2. ↑ Michael J. Hughes, Forging Napoleon's Grande Armée: Motivation, Military Culture, and Masculinity in the French Army, 1800-1808 (NYU Press, 2012). ↑ Adrian Gilbert (2000). The Encyclopedia of Warfare: From Earliest Time to the Present Day. Taylor & Francis. p. 133. ISBN 978-1-57958-216-6. Retrieved 11 July 2014. ↑ Michael V. Leggiere (2015). Napoleon and Berlin: The Franco-Prussian War in North Germany, 1813. p. 9. ↑ August Fournier (1911). Napoleon I.: A Biography. p. 459. ↑ Roberts 2014, pp. 459-61. ↑ "The Erfurt Convention 1808". Napoleon-series.org. Retrieved 22 April 2013. 1 2 David G. Chandler, The Campaigns of Napoleon. p. 708. 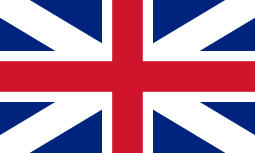 ↑ "The British Expeditionary Force to Walcheren: 1809". napoleon-series.org. 1 2 J. P. Riley (2013). Napoleon and the World War of 1813: Lessons in Coalition Warfighting. Routledge. p. 206. ↑ Leggiere (2007). The Fall of Napoleon: Volume 1, The Allied Invasion of France, 1813–1814. pp. 53–54. ↑ Lieven, Dominic (2010). Russia Against Napoleon: The True Story of the Campaigns of War and Peace. Penguin. pp. 484–85. ↑ "Napoleon's act of abdication". Bulletin des lois de la Republique Française. Retrieved 28 August 2009. ↑ Latson, Jennifer. "Why Napoleon Probably Should Have Just Stayed in Exile the First Time". 1 2 3 "PBS - Napoleon: Napoleon and Josephine". 1 2 "L'Empire et le Saint-Siège". Napoleon.org. Retrieved 15 June 2011. ↑ William Roberts, "Napoleon, the Concordat of 1801, and Its Consequences." in by Frank J. Coppa, ed., Controversial Concordats: The Vatican's Relations with Napoleon, Mussolini, and Hitler (1999) pp: 34-80. ↑ Nigel Aston, Christianity and revolutionary Europe, 1750–1830 (Cambridge University Press, 2002) pp 261-62. ↑ Luis Granados (2012). Damned Good Company. Humanist Press. pp. 182–83. ↑ George F. E. Rudé (1988). The French Revolution. Grove Weidenfeld. p. 128. ISBN 978-0-8021-3272-7. ↑ Andrea Barham (2014). Napoleon Wasn't Short and St Patrick Wasn't Irish: When History Gets It Wrong. Michael O'Mara. pp. 47–49. ISBN 978-1-78243-095-7. ↑ See David Chandler, "General Introduction" to his Chandler, David. The Campaigns of Napoleon: The Mind and Method of History's Greatest Soldier (1975). ↑ Gregory R. Copley (2007). The Art of Victory: Strategies for Personal Success and Global Survival in a Changing World. Simon and Schuster. p. 97. ISBN 1-4165-2478-9. ↑ Christopher Hibbert (1999). Wellington: A Personal History. Da Capo Press. p. 171. ISBN 0-7382-0148-0. ↑ van Crevald, Martin (1987). Command in War. Massachusetts: Harvard University Press. p. 64. ISBN 0-674-14441-4. ↑ "Napoleon Bonaparte Having Been Short is a Myth". Today I Found Out. Retrieved 10 November 2015. ↑ Nature Clinical Practice Gastroenterology & Hepatology (12 May 2006). "Nature Clinical Practice Gastroenterology & Hepatology | Napoleon Bonaparte's gastric cancer: a clinicopathologic approach to staging, pathogenesis, and etiology | Article". Nature. Retrieved 25 January 2014. ↑ Bernard Schwartz (1998). The Code Napoleon and the Common-law World. The Lawbook Exchange. p. 7. ISBN 978-1-886363-59-5. ↑ Robert R. Palmer and Joel Colton, A History of the Modern World (New York: McGraw Hill, 1995), pp. 428–9. ↑ Denis Février. "Un historique du mètre" (in French). Ministère de l'Economie, des Finances et de l'Industrie. Retrieved 10 March 2011. ↑ Thierry Sabot (1 October 2000). "Les poids et mesures sous l'Ancien Régime" [The weights and measures of the Ancien Régime] (in French). histoire-genealogie. Retrieved 10 February 2011. ↑ Clive Emsley (2014). Napoleon: Conquest, Reform and Reorganisation. Routledge. p. 52. ↑ Margaret Bradley, "Scientific education versus military training: the influence of Napoleon Bonaparte on the École Polytechnique." Annals of science (1975) 32#5 pp: 415-449. ↑ Colin S. Gray (2007). War, Peace and International Relations: An Introduction to Strategic History. Routledge. p. 47. ISBN 978-1-134-16951-1. ↑ Repa, Jan (2 December 2005). "Furore over Austerlitz ceremony". BBC. Retrieved 5 April 2010. ↑ "Call for Papers: International Napoleonic Society, Fourth International Napoleonic Congress". La Fondation Napoléon. Retrieved 27 June 2008. ↑ Laurent, Ottavi (8 February 2012). "A New Napoleonic Campaign for Montereau". Foundation Napoleon. ↑ "Napoleonic Code". Encyclopædia Britannica. Retrieved 13 April 2012. ↑ Lucotte, Gérard; Macé, Jacques & Hrechdakian, Peter (September 2013). "Reconstruction of the Lineage Y Chromosome Haplotype of Napoléon the First" (PDF). International Journal of Sciences. Alkhaer Publications. 2 (9): 127–139. ISSN 2305-3925. Bell, David A. (2015). Napoleon: A Concise Biography. Oxford and New York: Oxford University Press. ISBN 978-0-19-026271-6. Archer, Christon I.; Ferris, John R.; Herwig, Holger H. (2002). World History of Warfare. University of Nebraska Press. ISBN 0-8032-4423-1. Brooks, Richard (2000). Atlas of World Military History. HarperCollins. ISBN 0-7607-2025-8. Hindmarsh, J. Thomas; Savory, John (2008). "The Death of Napoleon, Cancer or Arsenic?". Clinical Chemistry. American Association for Clinical Chemistry. 54 (12): 2092. doi:10.1373/clinchem.2008.117358. Retrieved 10 October 2010. Poulos, Anthi (2000). "1954 Hague Convention for the Protection of Cultural Property in the Event of Armed Conflict". International Journal of Legal Information (vol 28 ed.). Sicker, Martin (2001). The Islamic World in Decline: From the Treaty of Karlowitz to the Disintegration of the Ottoman Empire. Greenwood. p. 99. Wilson, J (1975). "Dr. Archibald Arnott: Surgeon to the 20th Foot and Physician to Napoleon". British Medical Journal. 3 (vol.3): 293–5. doi:10.1136/bmj.3.5978.293. PMC 1674241 . PMID 1097047. Dwyer, Philip (2008). "Remembering and Forgetting in Contemporary France: Napoleon, Slavery, and the French History Wars". French Politics, Culture & Society. 26 (3): 110–122. Hazareesingh, Sudhir (2005). "Napoleonic Memory in Nineteenth-Century France: The Making of a Liberal Legend". MLN. 120 (4): 747–773.